There are additional transaction tracking fields, these are optional fields. However, if you enter this information it will track into a hotsheet report. You can track the list price, sales price, listing date, listing expiration date, contract acceptance date and the close date. The Hotsheet Report will give you insight into your new, expired and withdrawn listings, contracts accepted and closings over a period of time that you can select. Your active listings will include the address, transaction type, listing date, agent assigned, list price and sales price. Your under contract transactions will pull information with the contracted acceptance date and include the address, the transaction type, contract acceptance date, agent assigned, list price and sales price. Closed transaction will pull information with the closed date and include the address, the transaction type, contract acceptance date, agent assigned, list price and sales price. 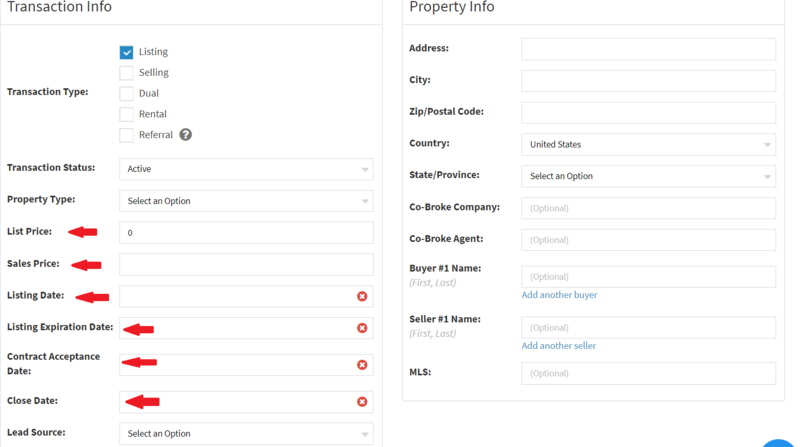 Expired listings will pull information from the listing expiration date and include the address, the transaction type, contract acceptance date, agent assigned, list price and sales price. Withdrawn will pull information if the transaction has been withdrawn and by the withdrawn date and include the address, the transaction type, contract acceptance date, agent assigned, list price and sales price.